You are here: Home / Ethnic Groups / The People of Sulawesi / Who are the Toli-Toli? The Toli-Toli are also known as Tontoli, Totoli, or Gage. They live in the Toli Toli regency of Central Sulawesi province. The Toli-Toli area has steep rolling hills along the coast. Toli-Toli is derived from the word totolu meaning three. According to folklore, the Toli-Toli derived from three persons who incarnated from heaven to earth through olisan bulan (golden bamboo), bumbung lanjat (peak tree of Langsat) and ue saka (similar to rattan). Olisan bulan incarnated is known as Tau Dei Baolan or Tamadika Baolan. 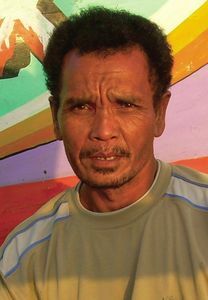 Ue saka incarnated is known as Tau Dei Galang or Tamadika Dei Galang. A princess who incarnated as bumbung lanjat is known as Buki Bulan. The Toli-Toli language is more closely related to the Boano language. It is related to the Tomini group of languages. Toli-Toli villages are small and comprised of houses on stilts. Toli-Toli living on the coast are often fishermen, while those in the hills typically cultivate rice in unirrigated fields, as well as corn and sago. The Toli-Toli produce high quality spices such as cloves, as well as copra and cocoa. Because of the many coastal areas, Toli-Toli areas are rich in marine products as fish and seaweed. Currently, the government is in the process of doing international trade with East Kalimantan province, Malaysia and the Philippines that is known as Totata and Tosamin. These are expected to bring many work and business opportunities. In an earlier era, the Toli-Toli people were governed by a sultan. Each clan was led by a head man who was chosen along ancestral lines. Because of that, social classes developed among the people. The four classes are: royalty, nobility, common people and slaves. In the Toli-Toli area, the development of transportation tends to be slow. Adequate transportation is needed to support smooth distribution of their abundant crops. The Toli-Toli people are Sunni Muslam; however many do not strictly follow the teachings of Islam. In the more isolated locations, many of the Toli-Toli still hold to their local ancient religion of animism. They believe that inanimate things are indwelt by spirits. Many Toli-Toli mix worship of nature and their ancestors with Islam. Better education in schools and better vocational training would help improve the employment opportunities of the Toli-Toli young people. The people as a whole need improved infrastructure to market their produce and increase trade, in order to fully participate in the national and international economies. There are several very beautiful sites which still could be developed, especially the beaches of Lalos, Sabang, Tende, Bajungan and Kolondom; along with underwater tourism of pristine coral reefs, as well as various islands that are very suitable for resorts.